go to sleep! Seriously though, a 20-25 minute power nap when I'm having trouble keeping awake can greatly increase energy and alertness and therefore speed up productivity and get you to bed faster! eat something slowly. No, not the twix bar in the cabinet or that bag of chips, I'm talking about some nuts or baby carrots, maybe some apple slices, especially from the fridge! The coldness will keep you from getting too comfortable, the chewing will keep you alert, and they're healthy and yummy too boot. It'll keep your mind stimulated. I also keep some gum on hand for this purpose when I don't feel like eating more.haha also eat them one at a time and not in handfuls. No sugar! you'll eat mindlessly at night which defeats the purpose of indulging in treats, and you'll have a bit of energy and then an increased brain crash, brain fog, drowsiness, all that. Not good. drink a lot of water. not only because it's great for you to keep hydrated, but funnily enough going to the bathroom often will keep you up and moving around! haha also when you're dehydrated your mind is slower and you feel more fatigued and sleepy. do something physical. 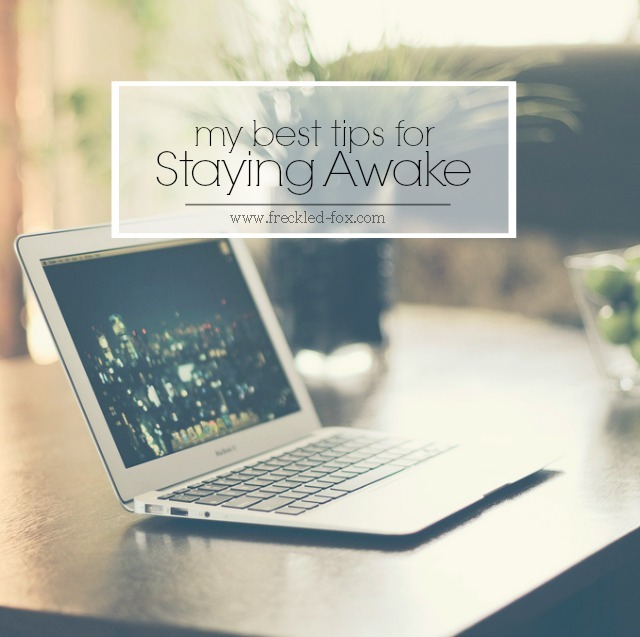 when I'm pulling a late-nighter I always mix it in with a few household chores, and any time I feel my eyes getting kinda fuzzy or every hour or so I head off to load the dishwasher or start a laundry load before settling back in again. also try jumping jacks, push-ups, and lunges. serious! keep a timer going. Watching the seconds tick by physically will help you be quick and efficient! Also I like to set (and write down) a time that I think is reasonable for each task on my list, then I choose the task, set the timer, and watch as your fingers and brain try and beat the clock. I work so much faster! keep the temperature low. A warm work-space will bring about that same feeling of relaxation that you get in a spa or sauna and you're going to be much more drowsy. keep things at a cooler temp if you can, but if not then turn on a fan or step outside if it's a cool night. the breeze will keep your senses active and your brain alert and awake longer! do some stretching. again with the physical activity I know but sitting for a while can make you tense and stiff as I'm sure you know! so make sure to twist your back, roll your shoulders and your head, keep your limbs limber and relaxed, and your blood-flow will stay steady and keep your body awake. splash cold water on your face. I know it may sound cliche, but it actually works! Fill your cupped palms up with some cool water from the tap and just put your face in your hands. It'll give you a little revitalizing shock to your system and feel very refreshing I promise! Drinking a lot of water really does help! I love these tips, thanks for sharing! Great tips! I also find that eating something will help keep me up. I used to munch on dry cereal and granola but then I learned that can sometimes contain tryptophan (sp?) which is the same thing that is in turkey and will make you very tired. Now I just stick with celery or nuts. A bunch of great tips all in one place! I love snacking on veggies and almonds when I'm trying to stay awake. I find also that hopping in the shower can be a great 20-minute reset on your mood and energy, especially if it's going to be a *really* long night...just don't make the shower too hot or you'll get sleepy! Cold water on the back of your wrists and behind your ears always works well! I agree with the power nap! It definitely helps. Great tips! Thank you! I've been having to work the late shifts at work lately and been having to cave into my Starbucks cravings to make it through! I have a job in retail and it can be pretty difficult to stay awake during long shifts. Thanks for these tips! I will definitely try them out! You are a machine Emily!! But #2 is very true, eating sugar mindlessly is not good and we all do it so much. Such good tips! I definitely needed this lately! Sit up, take a quick walk around outside in fresh air, and definitely grab a glass of ice water to drink! Power naps work wonders, too, so I'm all about those! I needed this post the other day. I didn't get any sleep and pulled an all nighter, the next day I had to go to work. As a lifeguard, we are suppose to be super alert and paying attention constantly. I couldn't keep my eyes open that I had to call my boss and say I couldnt perform my job properly and needed to go home.Sadly, no one could cover and I was stuck there all day. In order to attempt to stay awake, I'd drink loads of water, put a cold wet rag on my eyes, and when I got an opportunity a power nap was needed (20 minutes). It wasn't easy, that is for sure. Love these tips! I find that keeping the temp low and going outside for a bit helps me stay awake. The use of essential oil is my favorite. And which food, low calories, if you know, help to go sleep? Or at least rest better. I am generally very quiet on comments, but I do love your blog for the fitness and also, that family is just part of all of it. I recently decided to quit coffee, which was very difficult, but I felt and I have referenced this post a great deal. The sit ups really help!